Rotary index for storing telephone numbers and addresses. Adding addresses and telephone numbers is easy due to the simple removal and insertion of the cards. 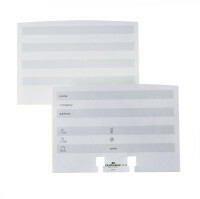 100 pre-printed cards for manual entries for TELINDEX flip,2416 and TELINDEX desk, 2412.